Description: Gayle Bradley’s Air from Spyderco is designed to be ultra lightweight and a gentleman’s folder. All premium parts like carbon fiber and titanium liners along with CPM-M4 steel combine to make one serious high-tech knife. 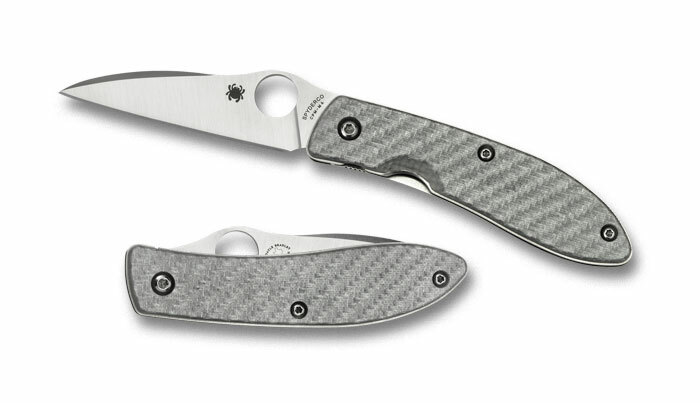 From Spyderco: “The Air is meticulously manufactured from premium materials that literally allow it to live up to its name. Its handle is built on a foundation of full-length titanium liners that also support the structure of its Walker LinerLock mechanism.” The Air does not have a pocket clip. This entry was posted on Wednesday, September 5th, 2012 at 9:18 pm	and is filed under 2" to 3" Knives, Designer - Gayle Bradley, Handles - Glass Fiber, Lock - Liner Lock, Manufactured - Taiwan, Steel - CPM M-4, Type - Folding Knife, Type - Gents Knife, Type - Office Friendly. You can follow any responses to this entry through the RSS 2.0 feed. You can leave a response, or trackback from your own site.